Larry Burk is a musculoskeletal radiologist who works part-time as a dream tapping coach at Oriental Health Solutions, LLC, specializing in Emotional Freedom Techniques (EFT), hypnosis and dreamwork. Dr. Burk is a Consulting Associate in Radiology at Duke University Medical Center and Co-Founder of Duke Integrative Medicine. His book Let Magic Happen: Adventures in Healing with a Holistic Radiologist was published in 2012. It includes how-to-do-it instructions for his top ten self-healing mind-body-spirit techniques. Another book Dreams that Can Save Your Life: Early Warning Signs of Cancer and Other Diseases was published in 2018 based on research with women who dream their breast cancers prior to the onset of symptoms. His path into coaching began with a course in hypnosis in 1990 followed by training in Anodyne Imagery in 1995 and certification in clinical hypnosis in 2011. 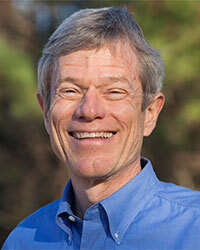 He learned EFT in 2002 and became a Certified Energy Health Practitioner in 2010. He completed Margaret Lynch’s Tapping on the Shadow Issues of the Lower Four Chakras certification in 2017 and Carol Look’s Yes Code coaching certification in 2019. He offers coaching to clients with a variety of issues including pain, immune and sinus conditions. Burk does not provide primary care, order lab tests or prescribe medications, but will review radiology studies as part of your assessment. He has offered quarterly group EFT sessions at OHS since 2004 and individual coaching consults since 2009.